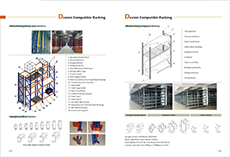 American Gondola Shelving is widely used in USA, Canada and South America. 1.The sizes are compatible with USA standard gondola shelving system. 2. Rectangular tube uprights punched with 1″ pitch holes. 3. Steel pegboard panel, plain panel, slatwall panel, MDF hole panel are available. 4. Standard shelving width 3′ and 4′, 14″ to 24″ depth, Height from 48″ to 96″. 5. Lockable brackets welded with shelves provide strong stability. 6. New europe type EPOS shelf front for ticket strips and acrylic riser and dividers.